15/09/2013 - Phnom Penh. Thousands of CNRP (Cambodian National Rescue Party) supporters march together with opposition leader Sam Rainsy through the streets of Phnom Penh to protest against the election results. © Thomas Cristofoletti / Ruom 2013. 15/09/2013 - Phnom Penh. Police prevents the access to Norodom Boulevard to opposition supporters with barricades of barb wires. © Thomas Cristofoletti / Ruom 2013. 15/09/2013 - Phnom Penh. 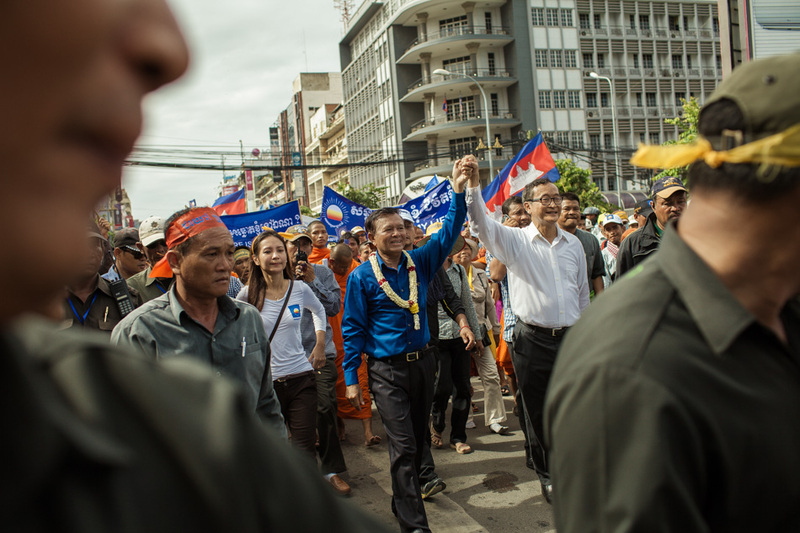 Opposition leaders Sam Rainsy and Kem Sokha march hand by hand through the streets of Phnom Penh starting a 3 day protest to contest the election results. © Thomas Cristofoletti / Ruom 2013. 15/09/2013 - Phnom Penh. Monks bless opposition leaders Sam Rainsy and Kem Sokha after their arrival at Freedom Park in Phnom Penh. © Thomas Cristofoletti / Ruom 2013. 15/09/2013 - Phnom Penh. Thousands of CNRP supporters cheer opposition leaders Sam Rainsy and Kem Sokha after their arrival at Freedom Park in Phnom Penh. © Thomas Cristofoletti / Ruom 2013.